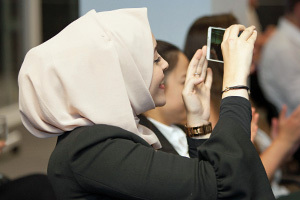 Fatima Benkhaled is a recipient of an Amazon Women in Innovation Bursary. She is a student at King’s College London, where she is studying electronic engineering and management. 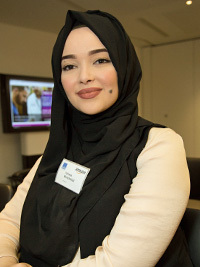 Fatima is also an associate for the social mobility charity, upReach. 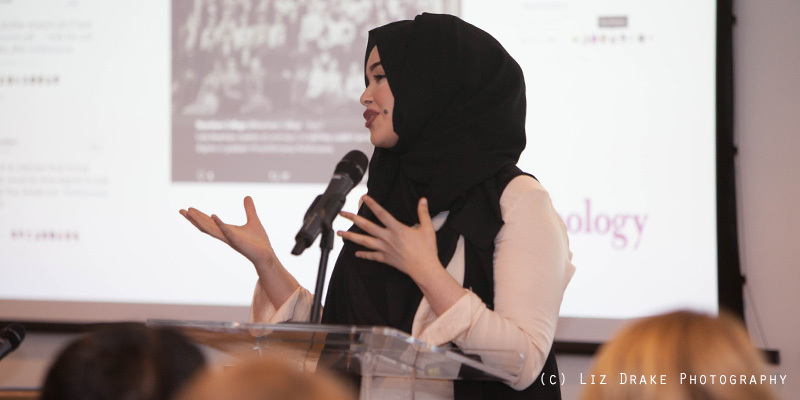 Fatima was a speaker at our Diversity Thought Leaders’ event at Warwick Business School in The Shard on 20th November 2017. She shared her experiences of being an Amazon Women in Innovation Bursary recipient. I went to a state school. I didn’t really have much direction in terms of where I wanted to go, but then someone came to my school to talk about engineering and structural engineering, so that stimulated my interest in engineering and technology. I decided to pick A-levels I thought would allow me to get the best of both worlds – engineering and business sense, so I chose maths, biology, English and economics. I then applied to King’s College London for electronic engineering with management. I did my research and I went for it, got the offer from Kings, and got into my chosen university. I’m in five days a week but every day is quite different. Thursday is a lab day where I have a three-hour lab session playing around and experimenting with different technology. Every day brings a new challenge. I discovered the Amazon Women in Innovation Bursary in an extremely random way. I get emails regularly from the departmental office and one day I received a message saying I was eligible to apply for the Woman in Innovation Bursary because I’m studying an engineering related degree. I didn’t really think much of it. In fact, I thought there was no way I was going to get in, but then I thought “why not?”. So, on the actual deadline day, I went ahead and filled out the form, and applied. I didn’t think much of it and completely forgot about it pretty much straight after. A few weeks later imagine my surprise when I received an email saying: “Congratulations, you’re eligible for the bursary and you’ve been selected!” I was so shocked, I couldn’t believe it. It’s not just a bursary, but I also get a mentor from Amazon’s Development Centre in London. Obviously, Amazon is such a prestigious company. It’s a global organisation and is growing so fast. So, getting that support from someone who I am in contact with on a daily basis has given me so much. My mentor has helped me with so many applications. It is also about having someone to look up to as well because she is the woman in tech and she is doing incredibly well for herself. The event was absolutely incredible! I was surrounded by so many powerful women and people who really do just want to create positive change. They were very, very passionate about diversity and inclusion – whether you are disabled, a woman, or from an ethnic background – it should not affect your chances of achieving greatness. I was there to speak about how and why Amazon invested in me. I am a student and I come from a low-income household, but Amazon and my university saw potential in me. I also spoke about why I chose engineering and I wanted to let the audience know that with the right direction and the right help, any of us can achieve whatever we want. 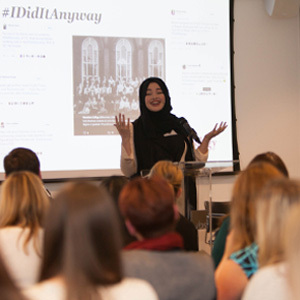 The event really stimulated discussion on innovative ideas to foster greater diversity and inclusion, and see what people and organisations are doing. I enjoyed hearing what Arnold Clark is doing in the automotive sector. 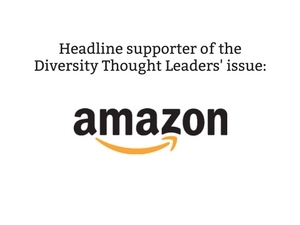 I learnt more about what Amazon is doing to champion diversity, and also a bit about the legal sector. It was just an incredible event and I am really grateful I was able to go and meet such incredible people. I was also able to network with some incredible women who have successful careers. I left the event inspired and excited, knowing that I can do it and that I can achieve whatever I put my mind to. I honestly think go for it! Do not let yourself be hindered in any way. In my course right now, there are about 40 students in my group and only five of them are female. That is a very small minority but use that to your advantage. Things are changing. Every single day brings technological advancement, change and opportunities. I genuinely feel that everyone should embrace that. There are no barriers out there. It is all down to the individual. All that you want is out there for the taking. You have got to come out there and be hungry. Just get out there. There’s the most amazing companies, like Amazon, who are willing to invest in you. They have invested in me. I have just learnt that they are taking on more women this year. Sophie, Claire and I are the first-year cohort, and we’re finding the programme incredibly useful. We’re all being encouraged to consider an internship at Amazon. I feel that is such a privilege for a company like Amazon to have invested in me with a bursary and to also want to invest in me further by giving me a mentor and an option to intern with them. There are so many companies out there that realise actually being diverse in terms of their workforce it is so important. There are opportunities out there for women with whatever career path may be. When I was at the Womanthology event I realised the women around me were mothers. They were teachers. They were businesswomen. They were academics. They were in the health industry. It was just incredible. My mentor at Amazon, for example, has got a daughter and at the same time looks after her parents, whilst fitting this in with her role at Amazon. This got me thinking that it really, really can be done. If you want it, you will find the people who want to invest in you. Doors will open. Based on my journey, I wanted it, I went out there, I went to events, I networked with people. I would honestly say, just go out there. Whatever is available at university, go ahead and grab that. Whatever is available at your school, go ahead and grab that. Whatever is available at your work, go ahead and grab that. You will get there in the end. Amazon has been so incredible to me and I feel this is a company that really wants to invest in me help me grow and show me the path. I do not have any family connections or networks to tap in to, so having that kind of encouragement and having someone from Amazon supporting me has made all the difference. It has helped me so much. I am also involved in a charity called upReach who have helped me in terms of tapping into the corporate world. There are so many opportunities out there; there is so much in technology, in consulting, in finance. I’m really excited about the future. I am still trying to get to know myself and I am really focused on getting a better university experience. I am only just getting to know what my strengths are and then I am going to figure out what the future holds for me, but for the time being I am really not worried too much about my career. I think I have the right mind set so I’ll be fine with whatever it is I end up doing, but I have got the help along the way. I have family, I have a mentor. I don’t know what tomorrow will bring or where I will end up but if I have got the right people round me and I have got the right mind set I can’t go far wrong. I definitely know that I want to do something within engineering because it is definitely a passion of mine and I love problem solving, so I can’t think of a better career!